PLAYING BEOWULF: GAMING THE LIBRARY | D.A.R.E. Playing Beowulf was a Digital Transformations project funded by the Arts and Humanities Research Council in the UK. It developed a game-authoring tool based on the Anglo-Saxon epic poem Beowulf, for use by literature students in schools and universities, curators and library visitors. The games were shown at a final conference at the British Library on December 7, 2015, Ludic Literature: Literary Games. The keynote speaker was Professor Andrew Prescott: ‘Reinventing Beowulf 1787-2015’. Our exciting conference took place on Monday 7 December at the British Library. The transformation of popular literature and children’s literature into giant franchises of book, film and game is a commonplace event in contemporary culture. It is less common to find similar transformations of canonical literary texts. This day showed how literary treasures such as unique manuscripts in the British Library archive might be re-imagined through drama, film and videogame by students and young people. It featured game-play, film and drama demonstrations, and talks by academics, educators and curators with different takes on how such transformations happen and what they mean. A group of UCL English students led by Dr Vicky Symons and Professor Richard North have been working on game adaptations of Beowulf and related texts. You can view some of their work in a separate post. Here’s one of the games, which explores the manuscript culture surrounding Beowulf, and acts as a first level prologue to to other games made by the students. We ran our workshop at the National Videogame Arcade as planned. 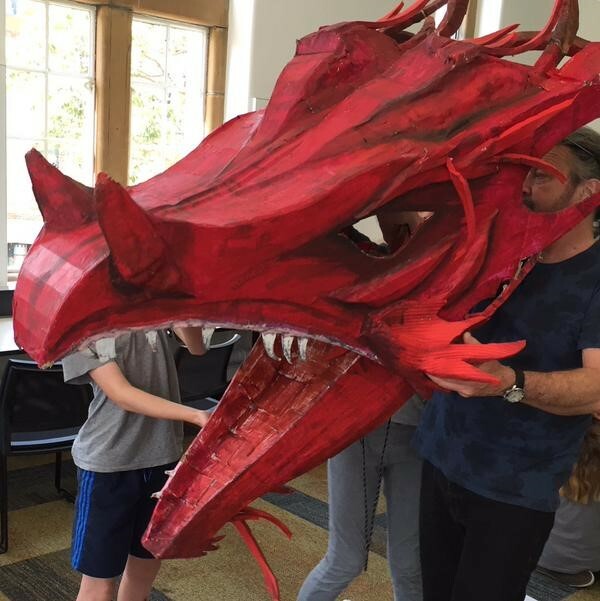 The participants enjoyed making Beowulf games – the first with the dragon! See the separate post for more details. 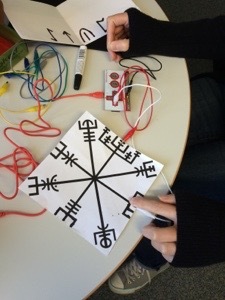 Alison Gazzard has been experimenting with a Makey-makey controller for the Beowulf games. It offers a way to extend the imagery and symbols of the poem to the physical world of the player, linked to the virtual world of the game. More experimentation to come! 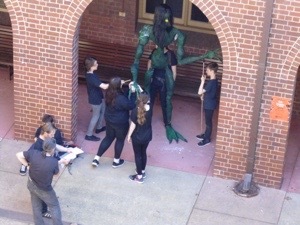 The drama and game workshops organised by the University of Sydney in partnership with the Australian Theatre for Young People began on the 28th September. 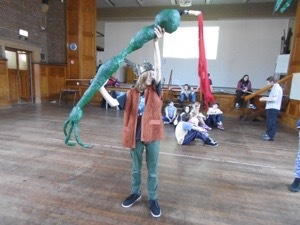 The week of workshops adapted the story of Beowulf through giant puppet-making and digital game design. 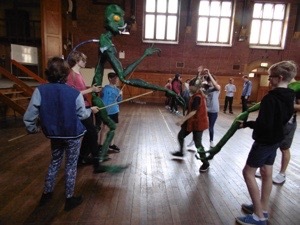 The work explored how narrative, combat, heroic quest and monster figures can be realised in the cognate forms of drama and game. The final day featured a grand performance for parents and researchers, mixing projections of game sequences with live drama and puppetry. A monster stalks the mead-hall! Mixing puppet theatre and game by using green screen. Russell talks us through his Beowulf game design. James talking us through the game level he made of Beowulf preparing to fight Grendel. And a giant puppet hand (Grendel?) working on the Missionmaker game tool! 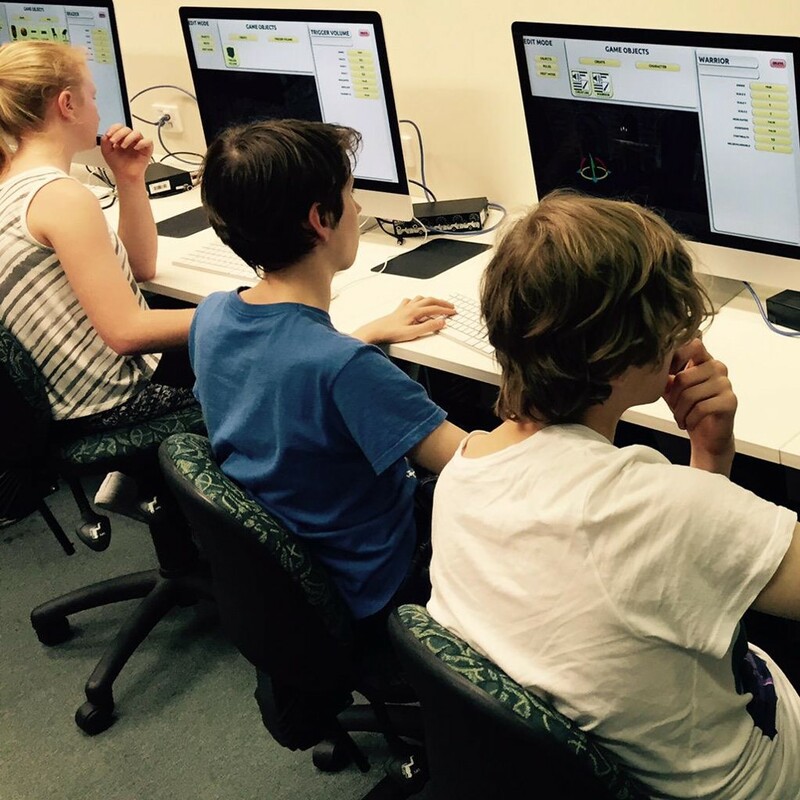 Students making games with the new software – programming Beowulf! 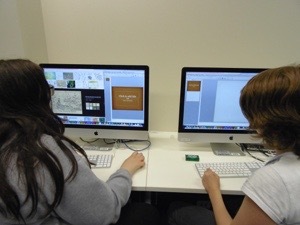 The tech team have been working hard over the summer to get the alpha version ready for the autumn workshops. Abel Drew, Andrew Kennedy and George Voicke have met the deadline with hours to spare! The video below is a capture of a demo level. While the combat system isn’t quite complete (the player’s fight animations are missing) it gives an impression of where we’ve got to so far. The project team have been invited by Andrew Prescott, Theme Fellow for Digital Transformations, to join the testing group for the online Electronic Beowulf 4.0 resource, edited by Kevin Kiernan, which offers unparalleled access to the facsimile images of the Cotton Vitellius A. xv manuscript digitised by the British Library along with transcription, literal translation, analyses of grammar and metre, and other riches. We look forward to connecting this with our work. We’ve made contact with one of the directors, and have visited the interior sets in Tyneside, which feature an ornate reimagining of Heorot, with decorative motifs inspired by illuminated manuscripts and wolf’s-head pillar capitals. 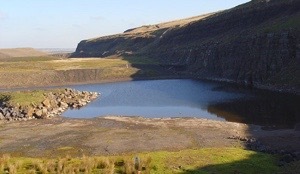 The exterior sets containing a full size mead-hall are in the disused Eastgate quarry, west of Durham. 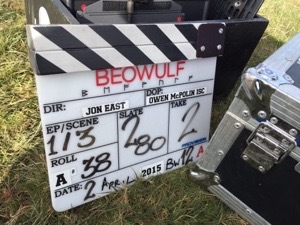 The directors and several of the actors regularly tweet to the #Beowulf community, along with assorted fans, scholars and passersby. Here’s the trailer for the series, screening in Spring 2016. These are early ideas from planning, design and knowledge-sharing sessions. Runes and riddles provide ideal game structures – clues, missions, puzzles. Runes from the Anglo-Saxon futhorc can point to entities in the game such as spear, chalice, lake, fire, wealth – all existing assets in our game tool. The games can explore and exemplify analogies between oral-formulaic and procedural narratives: compound descriptive entities (kennings; textures; animations); discrete ‘unit operations’ (Bogost), such as combat sequences; formulaic character types – ‘heavy heroes’ (Ong) and character modules. We used drama in the pilot to explore particular aspects of the poem: storytelling, improvised narrative, performance, character through roleplay, spoken language. Many of these are also features of the game, though we need to consider how game-authoring can design opportunities for (virtual) roleplay, improvisation through ludic choices, and participatory narrative. How can the drama inform the game, and the game inform the drama? 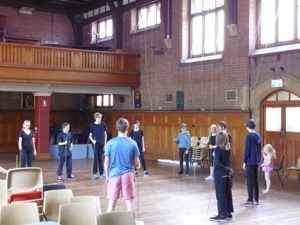 For example, how might the choreography of combat work across poem, drama and game? Grendel’s Mother needs to be fast and alien – the animations, physics and time economies of the game tool can express this; the character-creation system will allow our users to imagine and design their own version of this ambiguous character. 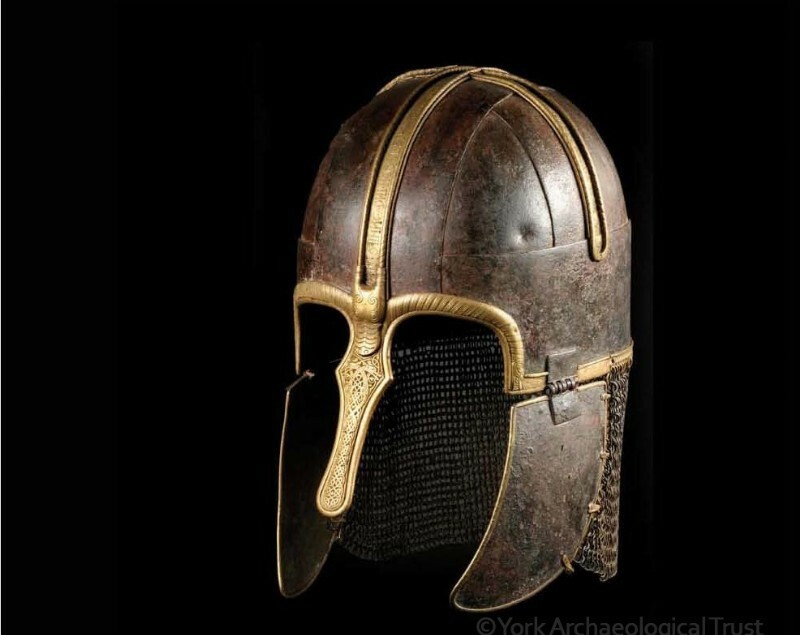 A good model would be the 8th Century Anglo-Saxon Coppergate helmet in the Jorvik museum. The text of Beowulf refers also to images of boars both on the helmets of the Geats and on Beowulf’s helmet (besette swinlicum – 1453). Tolkien’s commentary with his translation discusses these, along with the grima, the mask-component of the Geats’ helmets. Contemporary illustrated manuscripts can provide imagery we can build into activities and software, like these dragon images from Wonders of the East (another text in the British Library’s Nowell Codex which also contains Beowulf). Digital segments of the Beowulf MS can be inserted as a game resource for users to employ as backstory, narrative clue, reward, puzzle to solve. How to develop this into co-curation though? 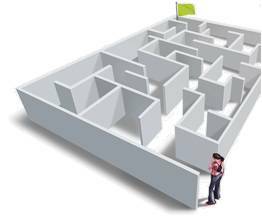 Game mechanics can represent motivation and affect in the poem: ambition, remorse, revenge, feud. We can build on programmable economies users can employ which we developed in Playing Shakespeare. Game mechanics such as the ‘Nemesis system’ in Shadow of Mordor (see Keith Stuart on this), which allows characters to remember player actions and take retribution, illustrate how games can program the economies of the feud cycles in the poem: the Swedes and Geats; the Danes and Heathobards; though more likely the Danes and the Grendelkin. The rational structuring of retaliatory combat is a characteristic of both game and feud, as well as being a persistent popular cultural trope (Batman and the Joker; Harry Potter and Voldemort; Lannisters and Starks). Combat tropes in the poem (wrestling, sinew-splitting, bone-bursting, knife and swordplay) can be modified in game, animation and drama. Interaction between our user-groups (young people, undergraduates, post-graduates, BL Young Researchers) can extend their understandings of the poem, drama and game design, for example by making games targeted at a particular audience. The Beowulf game authoring tool will enable users to transform the poem into a digital game, interpreting the text into playable characters, landscapes and events. This will allow curators of literary treasures at the British Library to design digital game experiences of the Beowulf manuscript, the only copy of which is held at the British Library. It will also however allow visitors, students and schoolchildren to design their own games, thus producing an example of co-curatorship through a digital environment. 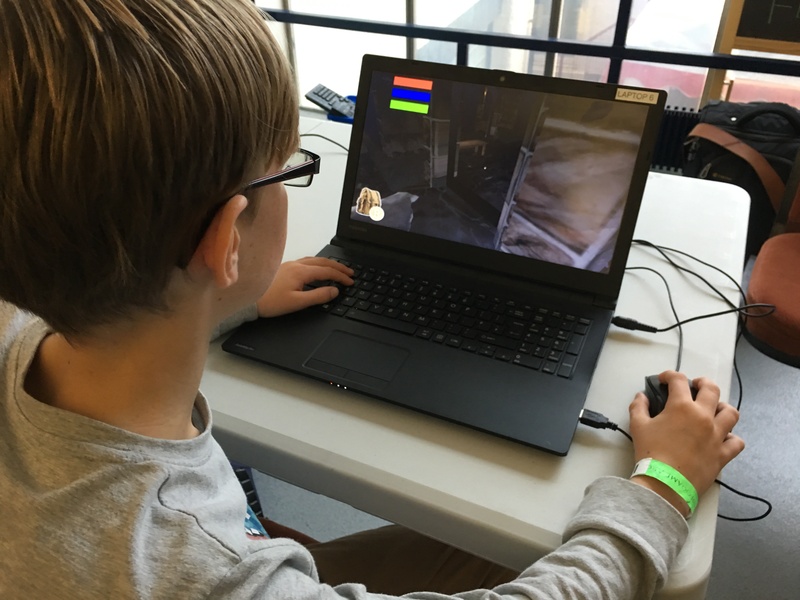 This vision of ‘gaming the library’ will explore how literary treasures can be engaged with in dramatized library spaces connected to game environments. We have chosen Beowulf for three reasons. 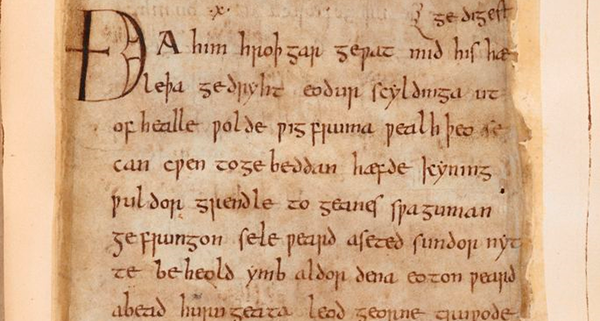 Firstly, the only copy of the Beowulf manuscript was one of the first major digitisation projects of the British Library – so this project can extend its history of digital adaptation into forms of game narrative and dramatic action. 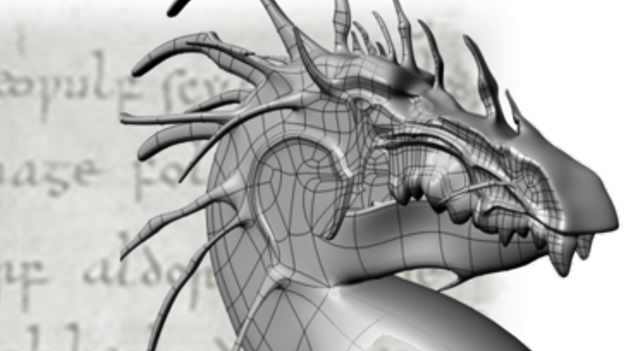 Extracts from the digital manuscript will be incorporated into the game-authoring tool. Secondly, it belongs to a narrative tradition which has strongly influenced the videogame designs of the last twenty years: archaic and mediaeval-themed fantasy games often deriving from Tolkien’s stories, themselves drawing on Old English and Scandinavian poems and sagas. 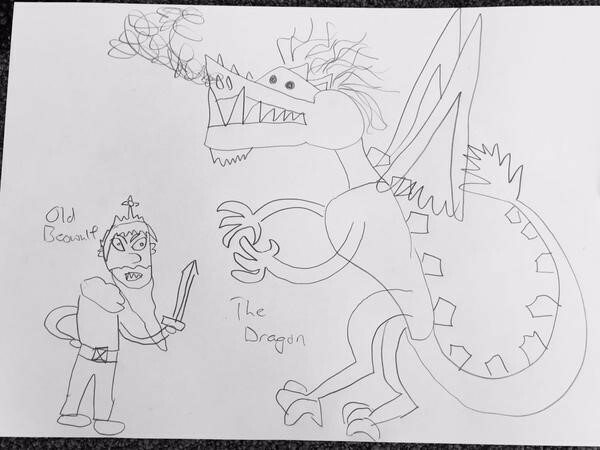 For Anglo-Saxon scholars and HE English students, adaptation of Beowulf into a videogame opens up ways of reinterpreting the poem, and connecting it to contemporary popular cultural contexts. Thirdly, Beowulf is a popular text in translation for secondary schools at Key Stage 3. If students are able to explore the poem through drama and videogame design, they also will make connections between this archaic form of narrative and their own gaming cultures. 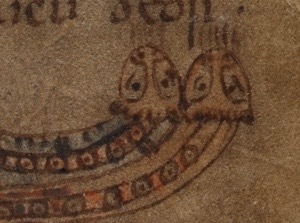 They can also explore in close detail the narrative, and even selections of the original text, such as the ambiguous term “aglæca”, used of Beowulf, Grendel and Grendel’s Mother (as ‘aglæc-wif’), but often differently translated to signify hero in the case of Beowulf and something monstrous in the case of Grendel and Grendel’s Mother. This ambiguity can translate into morphing visual characters, shifting point-of-view, and even spoken dialogue in their game designs. Here’s an example – a video capture of a demo game made by the team in a version of the software developed with The Globe in the Playing Shakespeare project, a 2012 Digital Transformations pilot project. Here, the player begins in the British Library, finds the Beowulf manuscript, hears a mysterious ancient figure speak the opening lines of the poem (in Anglo-Saxon), and takes on the role of Beowulf to find Grendel’s Mother. Download the Grendel’s Mother Game. Save it somewhere you can find it from. Ignore the warnings from Google etc! You’ll also need to download and run the application Missionplayer from the same folder. When it’s installed, open Missionplayer, navigate to where you’ve saved the game file, and go! It works on all but one of the PC’s we’ve tried it on – if you have technical problems, e-mail Abel Drew – a.drew@ioe.ac.uk. 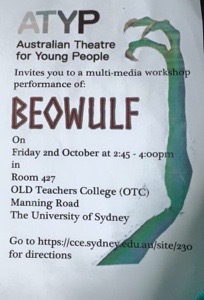 We conducted an unfunded pilot for the project in 2014, in which English PGCE students (trainee teachers) explored Beowulf through language, story-telling, drama, film and game-making. Here’s a short documentary of these workshops. 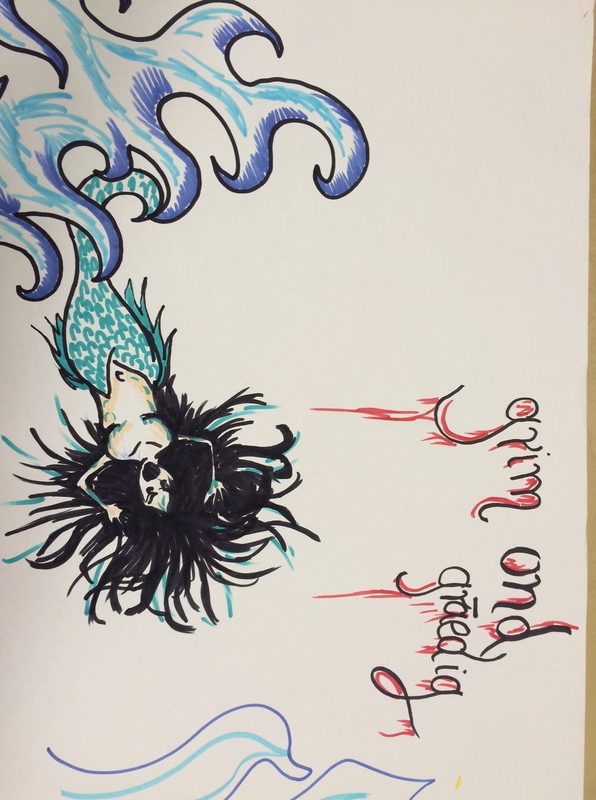 Here is a visualisation of Grendel’s Mother by one of the students, produced during the drama workshops. Below is a screen-capture of a play sequence of one of the students’ games, made by Andrew Smith, a futuristic re-imagining of Beowulf’s encounter with Grendel’s Mother, with the player adopting the (first-person) role of Beowulf. 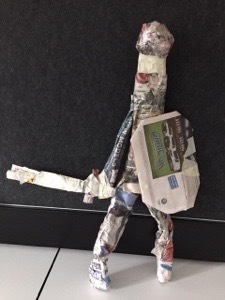 Andrew has constructed the figure of Grendel’s Mother to demonstrate her ambiguous nature, combining a beautiful face with monstrous legs. We’ve added a music track of Northumbrian small pipe music, which we used during the drama workshops that led up to the game-design. The game was subsequently analysed by a member of the team, Daniel Ferreira, whose research is exploring the procedural poetics of digital artworks. You can download his preliminary analysis below. And here are more examples of the games: a compilation of extracts from other games made by the teachers in training, showing the variety of interpretations they produced. The PGCE students who made these games were interviewed by Daniel Ferreira. His analysis of the games and interviews can be downloaded below. The game-authoring tool will be based on UCL IOE’s successful Missionmaker software, now developed by MAGiCAL Projects at the London Knowledge Lab. The original software, with generic visual assets, was used for the pilot project. 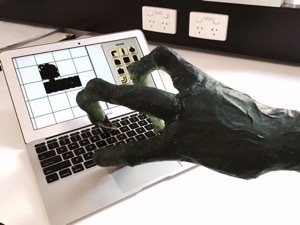 The funded project will develop a new tool in Unity, with bespoke assets informed by scholarship in Anglo-Saxon, English, Drama and media pedagogy, and game theory. The project is a collaboration between five partners. 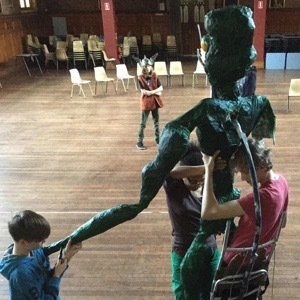 The UCL Institute of Education’s specialists in English, Drama and Media will lead, organising workshops for PGCE trainee teachers in drama and game design, and overseeing how those trainees replicate these experiences with their secondary school students. They will also lead the development of the game-authoring tool at the London Knowledge Lab, in collaboration with the software company Moviestorm in Cambridge. These activities will be supported by Anglo-Saxon scholars at UCL, who will also run workshops for undergraduates, and contribute to the scholarly effort to consider what game adaptation can contribute to the interpretation of Beowulf. The British Library will co-design the game-authoring tool, ensuring its suitability for curators and library visitors, and collaborating in the organisation of an international conference on Literature, Drama and Game at the BL’s conference centre. They will also run Young Researchers game design workshops for London teenagers. They will also host a Digital Conversation on the use of games in libraries and the GLAM sector. At the end of the project, they will host a one-day event on 7th December 2015 in the British Library conference centre: Ludic Literature, Literary Games: Playful encounters between literature, theatre, film and digital game. Further details will be circulated later in the year. The University of Sydney is the fourth partner, where specialists in educational drama and videogames will replicate the UK school workshops, and contribute to the interpretation of the pedagogic benefits of this activity. Game City, Nottingham, opened the world’s first cultural centre for gaming in March 2015, promoting the social, cultural and economic benefits of gaming. They will host workshops for the project, in which we will run game-making sessions with young people. These will explore the cultural aspects of game adaptations of Beowulf, and also the creative characteristics of coding, using the programming features of the software tool we will develop, aligned with the new computing curriculum in England. Ian Livingstone, CBE. Ian is a senior figure in the games industry, co-author of the NESTA Next Gen report, and Visiting Professor at UCL IOE. Professor Steve Connor, Grace 2 Professor of English at the University of Cambridge. Professor Ian Bogost, Georgia Institute of Technology. Dr John Potter, UCL IOE, specialist in young people’s digital making. Dr Diane Carr, UCL IOE, game studies. Dr John Yandell, UCL IOE, English. Dr Claire Robins, UCL IOE, specialist in Museums and Galleries education. Chris Waugh, Head of English & Drama, London Nautical School. Dr Seth Giddings, Associate Professor Digital Culture & Design at Winchester School of Art, University of Southampton. The soundtracks are so evocative – voices and music! The soundtracks are so evocative – great music and voices! I’m pleased with the lipsynced Anglo-Saxon! Lipsynched!?! So high-tech! Is it Richard or you?